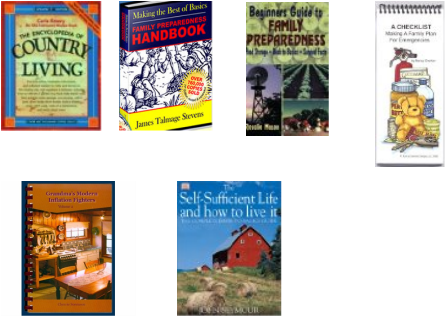 Preparedness/self reliance books can be found at many on-line stores, at the usual big book stores in many cites, as well as "used book" stores located just about anywhere. The main thing here is to start collecting good resources now. Waiting until you "need to know" will not guarantee the ability to find the books and most importantly, you need time to practice new skills. Preparedness education is one of the most important aspects of learning to be more self-reliant and better prepared. None of us need to waste valuable time and money re-inventing the wheel. A lot of what you will need to know will depend on your current lifestyle. Do you presently live in an urban environment with few opportunities to practice your skills or are you already living in a rural setting with "getting back to basics" your way of life? This is a leaning process and after a dozen years of reading and learning, we have compiled at least a good beginning list of books that you might want to add to your preparedness library. For the most part, we have stopped stocking books because of the high cost of shipping. We still have some in stock (these are displayed with an "order" button but most you will need to order from your favorite bookstore. It is our hope that this list will get you started.